Ladies, mark your calendars. In the year 2133, your earnings will finally match those of your male colleagues. It will take 118 years for the economic gap between men and women to close, the World Economic Forum said in its latest Global Gender Gap report. The WEF said that the slow pace at which the global gender pay gap is narrowing means women are now earning what men did a decade ago. 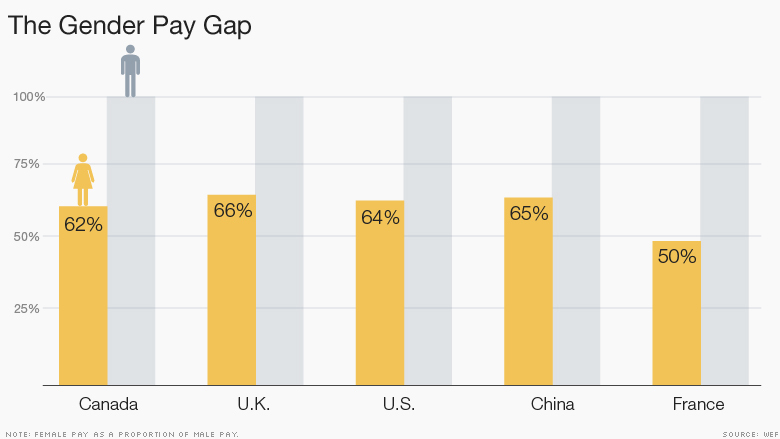 In the U.S., the gap stands at 64%, meaning that women earn about two-thirds of what men make for similar work. That's actually worse than it was last year, when the gap was 66%. The U.S. now ranks 74th in wage equality among 145 countries. Last year, it was 65th. The WEF measures the pay gap by polling CEOs around the world about their employees' salaries. Here are some other findings. Earnings aren't equal anywhere: There's no country in the entire world where a woman earns as much as a man for doing the same job. Brazilian women don't make even half: Brazil and Angola are the only two countries where women earn less than half than men: 48% in Brazil and 40% in Angola. Rwandan women win: Some of the world's poorest countries lead the equality ranking. Rwanda is this year's winner, with women earning 88% of what men make for the same job. Three developed countries in the top 10: Norway, Singapore and Finland are leaders in the developed world. Finland broke into the top 10 for the first time this year. Women work more here: Four countries in the world have a higher proportion of women at work than men. In Malawi, 85% of women work, compared to 81% of men. In Mozambique, Rwanda and Burundi, women are also more likely to participate in the labor force. Education doesn't match success at work: More women than men are enrolled in universities in nearly 100 countries, but they hold the majority of senior roles in only four countries. Saadia Zahidi, the head of WEF's Global Challenge on Gender Parity, calls this a "loss of talent." French women lead, but their pay doesn't: France is one of the worst performers in wage equality -- women earn only half of what men make. On the other hand, France ranks second in the share of women on boards of public companies. Saudi Arabia improves -- but still lags: Saudi Arabia has improved the most relative to its own position a decade ago. Still, only 27% of women work. 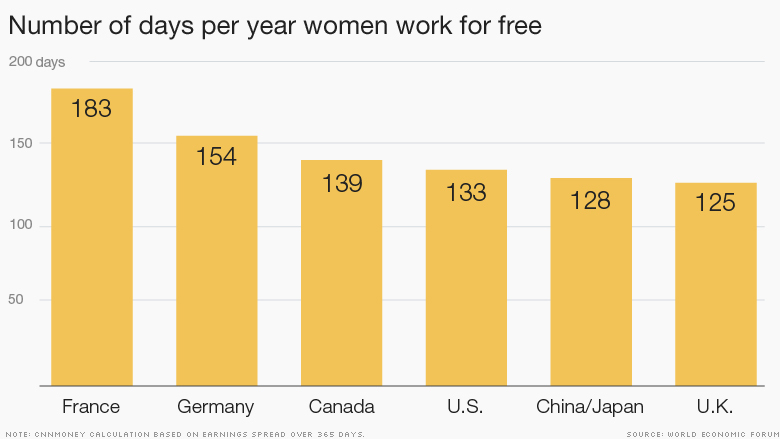 The women who work can expect to earn 60% of what their male colleagues make.